Researchers identified 33 spots where lakes likely existed. Where there’s water, there’s usually life — at least on Earth — and we just got confirmation that there used to be far more water on the surface of Mars than scientists previously believed. The news comes courtesy of a team of researchers from the SETI Institute and NASA’s Ames Research Center. They’ve identified dozens of potential “paleolakes” — lakes that existed when the climate of a region was different than it is today — in the southern hemisphere of Mars. And the finding could forever change the hunt for extraterrestrial life. 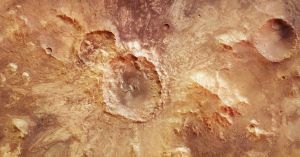 We already knew of one potential paleolake located in the northeastern part of Hellas, a massive basin in the southern hemisphere of Mars. In a study published in the journal Astrobiology on Tuesday, the researchers detail their discovery of 33 more. The team conducted a detailed hydrogeographic analysis of the region, mapping its channels and depressions to suss out where additional Martian lakes may have once existed. This turned up the 33 new paleolakes. By looking at each paleolake’s distinct characteristics, the team was even able to identify its most probable source of water: precipitation, groundwater, or rivers and streams. The discovery of these paleolakes is about more than just mapping the geology of Mars. It could also inform our search for life on the Red Planet. As the researchers note in the paper, the former Martian lakes could contain the biological record of what, if any, life once existed on the planet, so as we plan future missions to Mars, we might want to consider devoting significant time to exploring this once-wet region of its surface. Life Exists in the Driest Desert on Earth. It Could Exist on Mars, Too.